Our Edible Bar is a brand new concept, bringing a wide, curated selection of fresh botanical tastes, aromas and visuals to any event. The Bar is a guaranteed "wow" factor, engaging both foodies and non-foodies alike in a unique tasting experience. Farm.One is New York City's grower of rare herbs, edible flowers and microgreens for some of the best restaurants in the city. Our Edible Bar and Tasting Plates make these fresh, exciting ingredients available for the first time in an event setting. Guests can discover botanical ingredients for the first time, with the expert guidance of our farm team. Taste ingredients on their own, or paired with cocktails and other beverages, for a colorful, flavorful and aromatic experience like no other. 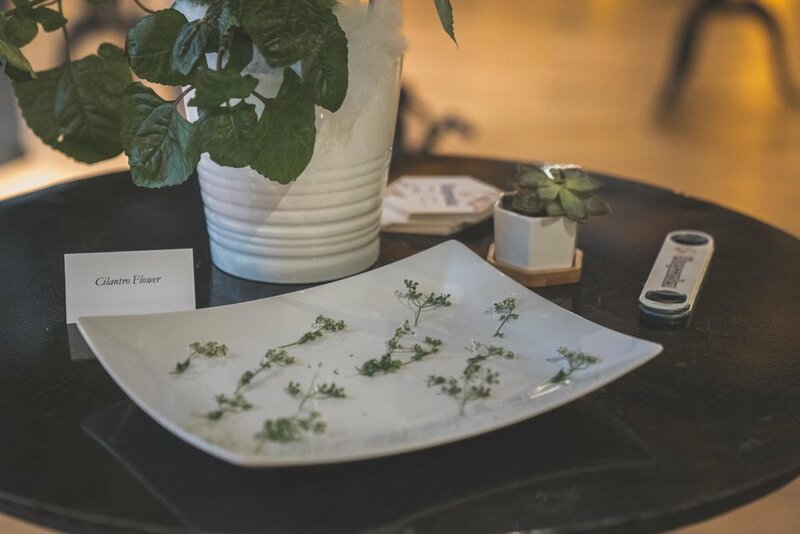 Guests receive plant descriptions and tasting notes from farm staff while they try different unusual herbs like amethyst basil, wood sorrel and more. The Edible Bar works in casual or formal environments - it's up to you! 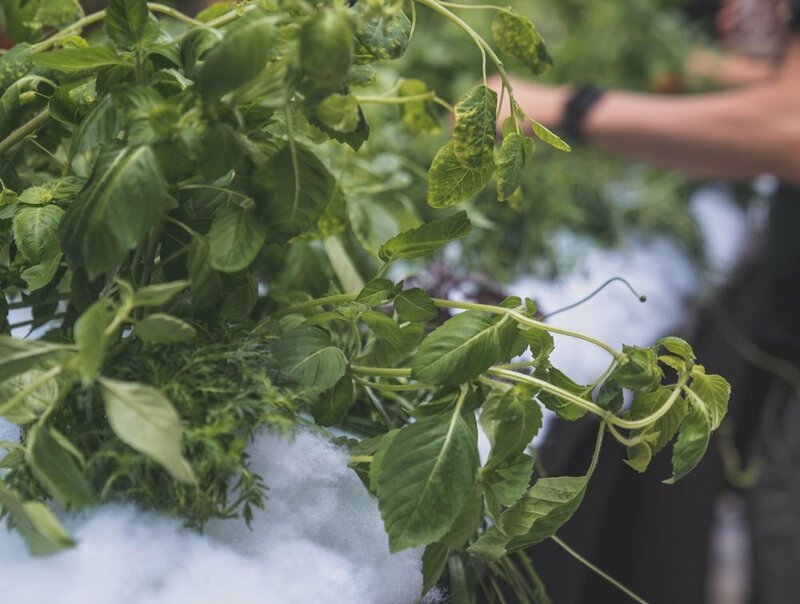 Our live plants give off delicious aromas as they are cut and served. What is the Edible Bar? The Edible Bar is a tabletop growing surface, transported from our farm, with a wide selection of live rare plants for tasting. The Edible Bar can be 2x4', 2x8', or 4x4'. The Bar is at bar-top height. We can place the Edible Bar on an existing flat surface, or on our own discreet display tables. Our Farm team brings the Edible Bar and live plants, and sets up the display. We cut and offer tastings to guests, explaining each plant, giving tasting notes, and describing the technology of the system and flavor profiles of the plants. Does THE BAR need lighting? No. We can set up our purple "grow lights" but these are more for fun and visual appeal. Can it be indoors or outdoors? Either is fine. No electrical or water hookup is required. The Edible Bar works well for any event where guests are standing or walking around, such as a wedding, conference or party. We are also available to speak to groups as a whole, at your request. To talk to our events team and discover more, use the link below. Perfect for larger parties and specific beverage pairings, our Tasting Plates allow hundreds of guests to sample specific flavors of the farm while they mingle. Plates can be in situ or served personally by our staff, with simple descriptions or detailed tasting notes. Talk to us about tailored offerings, including specific color palettes, regional selections and more. Over 200 different herbs, edible flowers and microgreen varieties are available. Reserve in advance for specific selections. We can also work with your caterer to use our produce in your menu. See our store for an idea of the product range. Descriptions can be minimal or verbose. Specific ingredients can be matched with wines, cocktails or other beverages. We can combine the Edible Bar with our tasting plates, conduct private tours and even private dining experiences with our restaurant partners. Talk to us to create a memorable and one-of-a-kind experience for you and your guests.